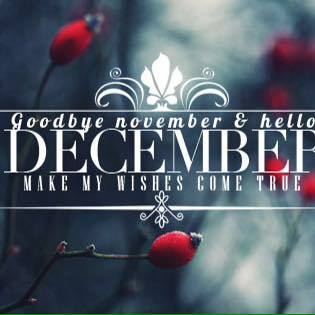 Welcome December, may all your wishes come true! The OFSC is working hard to make Holiday Wishes come true for our families, so they can have a healthy, happy holiday season. Stay posted for further details on our upcoming December Calendar of Events. 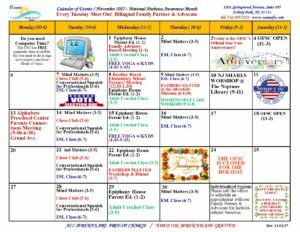 The Oceans Family Success Center’s November Calendar is out. Stop on by and let us help you make the positive changes you want to start making this month. November is a new month for a new you. We look forward to your visit. 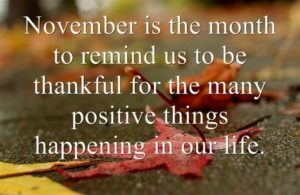 Wednesday’s Words of Wisdom: November is a new month meant just for you. Do something new, get a new result!! If you’re having trouble deciding where to start, start small. Visit the Oceans Family Success Center and let’s us help you make the positive changes you need. Come and visit the Oceans Family Success Center at the Asbury Park’s Trunk or Treat on 10/31/17 from 4:00-6:30. We will be at City Hall’s parking lot at One Municipal Plaza. We look forward to seeing all the little ghosts and goblins. BOO – IT’S HALLOWEEN TIME! Come visit the Oceans Family Success Center at the Neptune/McDonalds Trunk or Treat on 10/29/17 from 2-4. We’d love to see you in your costumes!! BE AWARE-NOT SCARED! With Halloween quickly approaching the Oceans Family Success Center wants to make sure the Greater Asbury Park Community’s children are safe and healthy, yet having fun! Please see our Halloween Safety Tips for parents, kids and homeowners/renters. The OFSC hopes to see you out and about at Community Halloween Events. THIS ONE IS FOR THE CHILDREN. Here’s 10 ways to be a great student! Remember that all your small efforts will turn into big successes. If you need any help with school, come to the OFSC’s Mind Matters classes on Tuesdays and Thursdays. Please call the office @732-455-5272 for details. With Back-to-School Nights quickly approaching, remember it takes THREE TO TEACH A CHILD! The parents, the teacher and the student must form A TEAM! GOOD COMMUNICATION IS ESSENTIAL. Follow this link to a video on how to build a good relationship with your child’s teacher. https://www.thefamilyconservancy.org/video-building-a-relat… REMEMBER YOU ARE YOUR CHILD’S BEST ADVOCATE!